Foot abduction brace similar to what I wore in bed in kindergarten. My feet weren't right at birth. 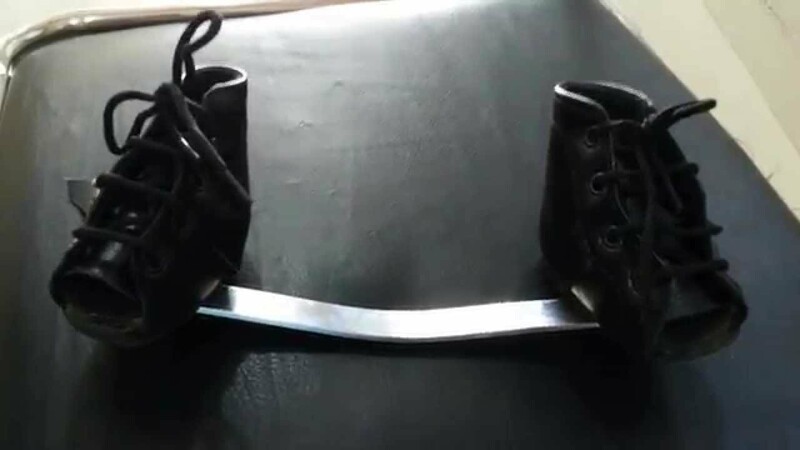 It wasn't full blown congenital talipes equinovarus (commonly known as club foot), but it was severe enough that, for six months when I was in kindergarten, I had to have my feet shackled together at night. The image above should give you an idea of both what that was like for me and what was wrong with me feet. As my mother likes to say, they were "turned in." Six months of struggling to sleep in that contraption (which, I distinctly remember, made middle-of-the-night bathroom visits next to impossible, especially as I did not yet know how to tie my shoes), coupled with many years of wearing orthopedic shoes, corrected my feet to the point where I could play Little League, walk to and from school, even backpack. Unfortunately, I somehow got the message through all this that I should not run like other children, and so, except for those rare occasions when I got on base, I didn't. Except for the mandatory laps in high school PE, which I hated vehemently, I was strictly a walker. In fact, it wasn't until I was 23 that I began running for my health. The year was 1984, and running shoes for bigger guys like me were not easy to find. Few manufacturers made shoes with wide enough toe boxes for my big feet, and shoes with the support features I needed were far beyond my price range--or would have been, had I known they were right for me. The reality was that I taught myself how to run without the assistance of a coach, podiatrist, or even a friend who was a runner. Surprisingly, the interval routine I worked out on my own was exactly like that recommended in running primers I've read. My shoes, however, were decidedly not. They were whatever I could find on sale that fit me. I continued running in sale shoes with wide toe boxes until 1991, when I developed my first case of plantar fasciitis, a painful tendinitis of the arch that makes walking excruciating. (Oddly, running isn't nearly as painful, but exacerbates the condition.) Podiatrists recommended rest and weight loss as cures--solutions I found counterintuitive, as running, my only form of exercise at the time, was also my only method for keeping my weight under control. But rest worked: a few months of restricting myself to walking, and the pain would subside, permitting me to resume running. One adjustment I did make was to visit a running store, where a salesperson analyzed my gait and put me in some beefy stability shoes. I also got divorced, lost my appetite for several months, and shed enough weight that I was able to run a marathon, and continue training, without any pain flareups, until 1997, when the pain came roaring back. This time, the podiatrist I visited put me in orthotics, and recommended motion control shoes. I had one other insight into why my feet gave me so much trouble. Almost all of my thousands of miles of running have been solitary, but in 1993, I had, for a few workouts, a running partner. Running behind me, he noticed that, while my right foot landed normally, my left foot executed a weird corkscrew with every strike. This was far more pronounced than the pronation (feet rolling out, rather than in) I'd thought I had, and was almost certainly a relic of the "turning in" I'd been born with, as corrected by the brace. Vibram Five Fingers running shoes. In 2011, feeling another bout of fasciitis coming on, I decided to try something new. I'd been hearing for some time about minimalist ("barefoot") running, using shoes that provided no support, and forced the feet to land more naturally, with a midfoot rather than heel strike. I bought a pair and found that, in fact, I could now run without any arch pain. Unfortunately, I also discovered the backs of my heels developing pain in a new location, most likely from the stress this style of running put on my Achilles tendon. Still, I continued experimenting with minimalist shoes for three years, until a sale at the Nike outlet store led me to try a pair of cushioned stability shoes. 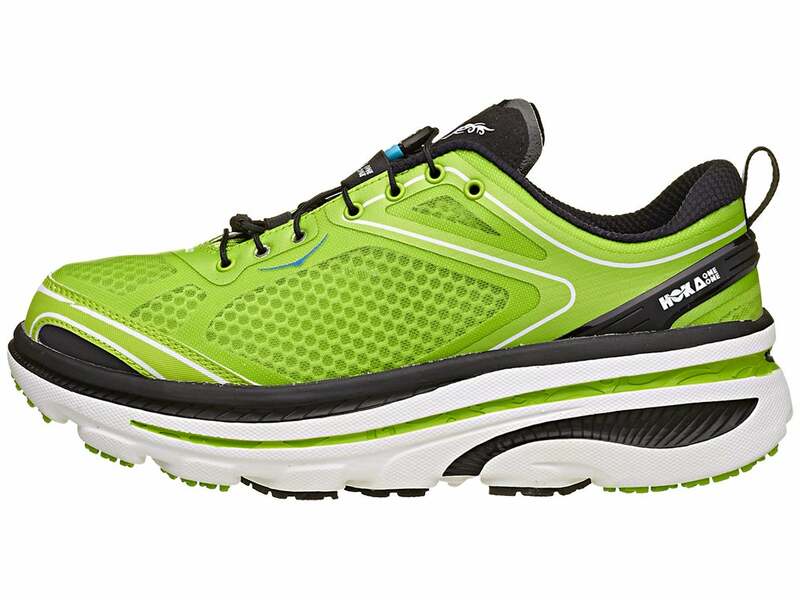 The Hoka One-One, possibly the most cushioned running shoe ever made. These shoes are as maximal as the Vibrams were minimal. There's so much cushioning in them that I feel like I'm running on wrestling mats. But they do something quite unexpected for me: they make me faster. I'm not sure how, but the two runs I've taken in these shoes have been significantly faster than any I've done in years. I realize that, with just two Hoka runs under my belt, it's far too early to be thinking about marathons. As Amy has reminded me, I had similar raves about the freedom afforded by the Vibrams, shoes with no cushioning at all that felt delightful for the first few months I wore them, but are now consigned to being the shoes I wear when I pressure-wash the patio. And certainly I've been running long enough (thirty years and counting!) to know that, as with educational reforms, hairstyles, skirt lengths, and anything else that can be viewed as a trend, anything revolutionary will eventually be viewed as old school until it can be revived under a new name. And so what? I'm rediscovering running, and I love it just as much as I did thirty years ago when I first realized it could be much more for me than simply an exercise. Yesterday I ran seven and a half miles, and it felt effortless. Tomorrow I may do even more. Sometime this summer, I'll enter a race. I won't be as fast as I was in my 30s, but that's not why I'll be doing it. This is about overcoming a disability, however minor it may have been. Some of the most profoundly moving healing stories in the Bible are about disabled people who find themselves suddenly able to see, hear, walk, even run. In the last three years, technology has compensated for my hearing loss, returned my sight to what it was when I was a toddler, and, now, given wings to my feet. To be running, seeing, and hearing at 54 (my age as of Tuesday) makes me feel like I am living in an age of miracles. What wonders will science do for me--and you--next?